Justin Simmons keeps moving up Draft boards as he dominated at the NFL Combine Monday. For the pure speed and strength events like the 40 or bench press, Simmons showed off times that were near the top. Plus he also tested well in quirky events like the shuttle run. I don't know what this showing will do for Simmons' stock, but it is hard to believe he will slip to the 6th round (like this profile suggested). Teams already knew that Simmons could play multiple positions. Now his raw numbers support that he will be among any team's leaders in speed. I hope that whoever draft Simmons knows what an asset they truly have. It is early, but maybe it is time to get excited about BC Baseball. They remain undefeated after beating Villanova Sunday. This is the team's first 7-0 start. They next play the Red Sox in their annual exhibition. Wouldn't be something for BC Baseball to play really well when Football and Basketball are falling apart? There are a few caution signs though. BC didn't start the season with elite ACC-level teams. Many of these games have been close. But for now there is hope. Maybe the supposed upgrade in talent will finally reach its potential. It was a little bit of the familiar -- poor decisions when the game got close -- and a little bit new -- terrible, terrible defense in the entire first half. In the end, BC couldn't do enough to close the gap and lost to Georgia Tech. If you want to get excited about anything it is that BC kept trying in the second half. But man, there was very little positive to takeaway from that game. I will try anyway. -- Milon's 3s are starting to drop. Next year he needs to shoot and make a lot more. -- Barnes-Thompkins is making good decisions. He should be a serviceable ACC level role player next year too. -- Carter's BC career is nearly done. That may seem harsh or overly cynical, but some of his turnovers were just flat giving up. I am not going to be able to watch this live, but I know some of you are. We all feel your pain. Tech is playing well so this doesn't appear promising. Leave your thoughts and comments below during the game and hope things break our way today. I will have a post-game post later today after I watch it back. With only a few games left, expect more and more coverage of our season. The reason: BC's chance to make history. If BC fails to win a conference game, BC will be the first team since the 1976-77 TCU teams. To loss this much, you have to be really bad and really unlucky. BC's next game is Saturday against a suddenly hot Georgia Tech team. Labels: Brad Bates, Jim Christian Year 2, season from hell part 2? Before the Facilities announcement and another basketball loss, I meant to write about ESPN's article on Darius Wade. It was pretty standard "athlete recovering from injury" stuff. What surprised me is that BC even made Wade available. The school usually steers coverage towards high-profile players. With Patrick Towles coming in, I assumed he would dominate the coverage. Maybe this means Wade has a chance to actually win the job. Is that a good thing though? Since the offense is changing all QBs should be equal. No one has the advantage of knowing the system or some sort of connection with Loeffler. Of the likely candidates, Towles has the most experience. Due to his injury Wade doesn't even have as much experience as Smith, Flutie or Fadule. Throw in Anthony Brown and that is a lot of guys for Wade to beat out. While he looked okay in limited play last year, nothing he did made anyone say that he's a future superstar. Yet here he is 100% healthy and getting PR support from the coaching staff. I expect Towles to win the job this spring, but it makes sense that Addazio is still giving Wade a chance. It keeps Wade happy and provides some stability in case things fall apart again. I just hope someone steps up and ends the losing. The team played with a little more effort, but were still way too sloppy and lost to Virginia Tech. What I found interesting is listening to Malcolm Huckaby. Here is ostensibly national analyst, yet he also happens to be a BC alum and a former BC radio analyst. Throughout the game he was openly and repeatedly critical of Eli Carter. Too many analysts have giving Carter a pass and said he's trying to do too much. Huckaby pointed out Carter's poor shot selection and sloppy passing. It doesn't make it any less frustrating to watch, but it gives me a little comfort that people close to the program are saying what needs to be said. Owens dunk will make the highlight reels. He was ok. Clifford looked good and played hard near the basket. Milon was a disappointment. We've seen him make the shots. Let's hope for more consistency next year. Three games left...it is almost over. The long, long promised sports facilities improvements finally saw the light of day. BC announced a $200 million dollar project for a new recreation center, new baseball/softball complex and the field house a.k.a. the Indoor Practice Facility. The timing off it all is interesting and certainly prompted some cynicism from frustrated fans, but overall this is good news. While all the money is yet to be raised, enough of it has been committed to go forward with the projects. That's a big deal since that eliminates one big hurdle. 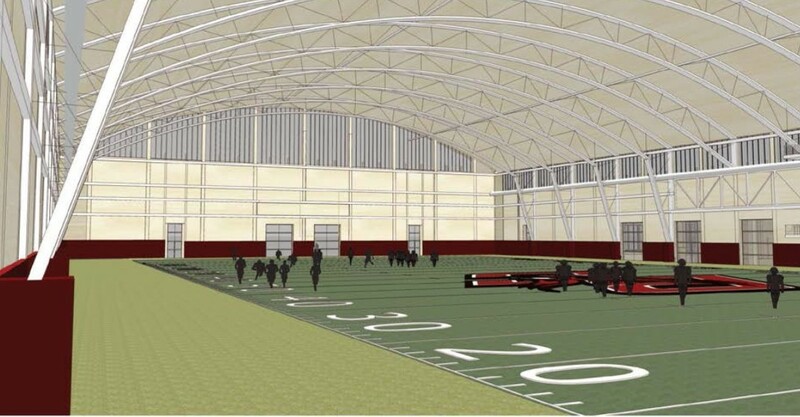 BC was the lone ACC school without an Indoor Practice Facility. Something had to be done and now we have a step forward. Addazio can sell this on the recruiting trail and we can pump it up to the press. The lingering question mark is when the facility will actually break ground. As with all building projects in Boston, this will require plenty of hoops to jump through. The hope is that by going public, having the money and keeping it well within BC's current athletic footprint, it can move fast. Bates is going to owe football fans and recruits a true timeline on this soon. The actual baseball component of this complex was announced years ago, but sat in limbo for a variety of reasons. The good news is that this announcement means the school is committed to having a baseball team for the near future. Every BC student of the last 25 years has heard that the Plex is going away. Like the Mods, the old building kept surviving. Now it seems like there is finally the funds and the willingness to modernize the recreational options. This won't impact the major sports, but will improve the day to day of the normal BC student. Bates still needs a plan for Conte and to show that he can get this from renderings to actual ground breaking, but I am happy that there is finally some progress. I had a conflict Sunday night and missed watching the basketball game live. When the night began I really thought I was going to miss my one chance to watch BC win an ACC game this year. I should have known better. BC Basketball embarrassed themselves again, losing to Wake 74-48. I don't know how the players feel, but Christian and Bates should both be worried. Either this team gave up or is very untalented. Neither excuse offers much hope for the future. Is there a win left on the schedule? I doubt it. As for how to fix this, (other than finding a miracle recruit), Christian has recruiting specialists, but now he needs to find an assistant coach who can install an offense. BC can't score for long, long stretches. That problem is not going to fix itself. They say that there is no such thing as bad publicity. BC is testing that theory this year. College Gameday took time on their show Saturday to highlight BC's potential embarrassing path. This is why BC's game against Wake is so important. The Deacons are not good and are shorthanded. They remain favored, but BC can win this game. Even if you don't care for Christian or Bates, hope for a win just to avoid more nonsense like this. Baseball got off to a good start, winning their opening game 5-1 over Northern Illinois. Starter Mike King only allowed one hit through seven innings. Former BC assistant Pete Carmichael Sr died this week. Carmichael served under Bicknell and Coughlin and followed Coughlin to Jacksonville. Condolences to his family, including BC grad Pete Carmichael Jr. It is only one game, but the difference between 0-18 in ACC play and 1-17 is huge. As of Thursday night, there are only two Power 5 teams who are winless in their respective league play: BC and Rutgers. I don't know or care if Rutgers can pull out a win in the Big Ten. But I do care if BC can. Any BC fan should care. There are plenty of excuses for BC's terrible season. Christian dealt with youth and injuries and gaping holes in the roster he inherited. The competitiveness of the conference is also unprecedented. Even Duke is clawing for conference wins. Yet that doesn't let Christian off the hook. Pulling out or even lucking into a win, would be a sign that this team has mental toughness, a smidgen of ACC talent and a coach who can make the right call in a close game. Christian needs to show he can persevere through this low point. The other person that needs a basketball win is Brad Bates. Going winless in basketball and football in one year would be a huge black-eye for the program. It would invite the critics and national media to say that BC doesn't belong in the ACC. These are Brad Bates' hand-picked coaches. Both coaches bottoming out at the same time, raises numerous questions about Bates' decisions in hiring and supporting these two coaches. I still think BC will pull one out. We've seen how it can happen. We just need a few things to break our way and for Christian to make a few right calls. I worry that if he cannot make the right calls in a close game when we stink, can he make the right calls when we get good again. Without Eli Carter, BC wins this game. That might seem unfair or diminishing the attention he draws on offense, but I really think he cost BC. His defense, his selfish shot selection and his cold shooting are the reason BC lost to Clemson. As the broadcast team said, the score doesn't indicate how close the game was. There were some bright spots. Clifford's good run continued. The only thing that slowed him were fouls. Barnes-Thompkins came off the bench and provided a much-needed spark. The 2-3 zone is looking better and hiding some of this team's issues. We are still not rebounding well for a 2-3 team, but the guys are getting better with their assignments. The defensive breakdowns came mostly off of slow rotations or when BC played man-to-man. I don't know what Christian is going to do with Carter. Is a 24-year-old at his third school willing to take coaching and constructive criticism? If he sits will the other teams just collapse down on Clifford? Will it help or hurt the locker room? BC is not playing for the postseason. At this point it is about building for the future and gaining a little bit of respectability...and winning a conference game. Christian needs to decide how Carter fits into that plan. BC subtly included Central Michigan in a scheduling email last week. Based on the email, Richmond was out and a one game series with Central Michigan was set for 2017. According to FB Schedules BC is paying CMU $650,000 to come to Alumni. Like some other scheduling moves, adding Central Michigan is an improvement, yet not exactly where BC needs to be. The good news is that BC won't play an FCS game next year. That's a huge change in recent strategy and a change in how other Power 5 teams are scheduling. While BC's 2017 won't include numerous non-conference heavyweights, there won't be one cupcake. That should earn some praise from the national critics who mocked our 2016 schedule. The only downside is that although it is a huge improvement over Richmond, I don't think many BC season ticket holders care about Central Michigan. In 2009 a good BC team facing a very good Central Michigan team only drew 34,000. Can we expect anything better next year? I hope so, but wouldn't count on it. Frigid temperatures caused a sprinkler pipe to burst during Sunday's basketball game. It is almost like Mother Nature wants news on the Sports Master Plan. As much as I would want to blame this on Conte being old and antiquated, the Boston Fired Department did blame the cold. This could have happened in a brand new building. As far as real updates on the Master Plan and the Indoor Facility...nothing. I have been told the money is there and BC is trying to clear the local politics before an announcement. I hope I am still not writing that same update a year from now. Sometimes it so very simple. BC took a lead a few minutes into the second half and Syracuse answered with a 3. And then another 3. And then another. The game was basically over and BC lost again. Aside from the mix of bad luck and defensive lapses, what really frustrated is that they couldn't answer Syracuse during those stretches. They couldn't buy a basket and missed plenty of layups/putbacks. If you're looking for encouragement, Barnes-Thompkins and Milon played well. Eli Carter did not and he still had a few of his ridiculous shots that he chucked before anyone in a BC jersey could be close to the basket for a rebound. One more pain point: Conte was filled with orange. There has been a lot of piling on by the Boston Media this week, so I will try not to make it worse today. Hopefully this team does something right before the season ends. Chipotle costs us a win earlier this year. Maybe we can blame another corporation for our anemic offense in basketball? In case you missed it, Big Ten teams are complaining about Maryland's Under Armour brand basketballs. The visitors say the weight and feel are off and are more like a "street ball." BC, like all Under Armour schools, uses the same ball. While I heard a few whispers about Under Armour shoes over the years, I have never heard anyone related to BC complaining about the basketballs. This all seems a bit whiny to me. If the schools really cared about consistency, they would adopt a universal ball. But that would leave too much money on the table. I don't think the problem with BC Basketball is Under Armour, but we can add it to the excuse list. Who has most to gain at the Combine? The NFL invited four BC seniors to the NFL Combine. Considering our recent drafts and our 3-9 season, that is an impressive number of invites. No surprise, all four (Abdesmad, Daniels, Simmons and Wujciak) are on the defensive side of the ball. All will go through the usual steps and tests, but who has the most to gain from the few days in Indianapolis? In my opinion is will be Abdesmad. Of the four he had the most checkered injury history. What the NFL doctors and trainers say after inspecting him might be as important as his 40 time. If he can minimize fear about his legs, maybe someone will take a chance. But recent BC guys with injury/recovery issues like Toal and Herzlich never built consensus on their health or recovery. Herzlich beat the odds and built an NFL career. Toal didn't. If you are going on pure potential, I think Wujciak is the most likely to play consistently at the next level. He's got the required size and strength for his position. Simmons and Daniels are competing with a much deeper field for their respective spots. Regardless of who goes where and who gets drafted, this could be the best BC draft in years. Let's hope all the guys get picked. The ACC named Jon Baker, Truman Gutapfel and Kevin Kavalec to its All Academic team. They all deserve congratulations. What's comforting is that regardless of the season and regardless of the coach, BC continues to place students on these sorts of lists and teams. It speaks to BC's academic structure and the type of kids we recruit. The BC Women's Hockey team waltzed to another Beanpot Championship Tuesday night. Hockey East suspended Miles Wood one game for elbowing BU's Ahti Oksanen during Monday's Beanpot Championship. Wood was given two minutes at the time, but the league viewed the game tape after and felt the penalty deserved more punishment. 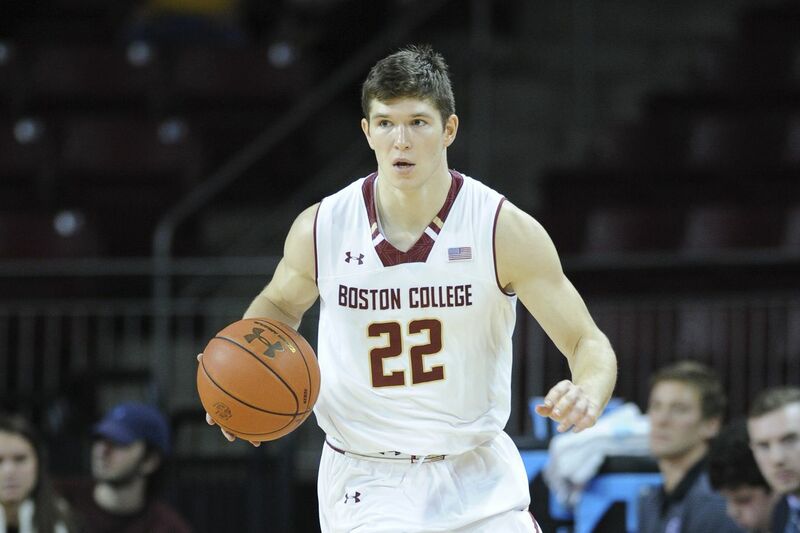 BC played their best basketball in weeks but still couldn't do enough to upset North Carolina. I admit I believed. When Carter made his 3 with just over two minutes left, I thought it was going to be our night. But even down the stretch BC made familiar mistakes (losing assignments on D and forcing bad shots on O) that cost them the game. Adding to the woe of the loss, Turner went down during the game with a bad looking injury. As much as we might want to take away a lot of positives and hope from this game, you cannot. BC's been outplayed and overmatched in all their other ACC games. Play three more close games and then I will feel like we are seeing progress. I feel for the fans who were there. They almost got to see something special. The next chapter comes this weekend. Who knows what to expect. Labels: BC vs UNC, Jim Christian Year 2, there's hope? BC brings back the Beanpot! Alex Tuch's overtime winner (below) gave BC its 20th Beanpot. OT can go in such crazy directions, I am just glad BC wrapped it up in the extra time. Let's hope this serves as another one of York's springboards to bigger hardware. There are no BC guys on the Broncos' roster, so no Eagles picked up Super Bowl rings Sunday. Luke Kuechly performed well, but football is a team sport and Denver had the better defense on Sunday. There was lots of talk prior to the game if Kuechly was the all-time best Eagle in the NFL. I still think it is too early to tell and still think Matt Ryan has the better chance to retire with that title. Kuechly has a Defensive MVP, but elite linebacker's windows are much shorter than QBs. As Peyton Manning showed, Ryan might have another eight or nine more competitive seasons. In the end, I want them both to do well. I also hope we send a lot more guys to the NFL over the next few years so that others enter the "best Eagle" competition. During the scoring drought at the start of the game, I really started to wonder if BC would score more than 10 points before the half. Things have gotten that bad. Even with a few runs to make it closer, the final score was pretty representative of how bad the loss to Louisville was. With listless play like this it is only fair to ask if this is the is going to be the worst basketball team in BC history. What were the positives? Barnes-Thompkins showed some fight and made a few nice shots. Dennis Clifford -- who was overmatched inside -- still played hard and did all right defensively. That is about it. Like all really bad BC seasons, watching is becoming a chore. The national basketball people are saying Christian needs time. I agree. But this season is not giving me much hope. Great coaches have down years. I don't think great coaches have years this bad...especially when the roster is filled with their players. Todd Fitch and Ben Albert are gone. Paul Pasqualoni and Rich Gunnell are on board. With the announcement coming just a day and a half after Signing Day, you have to infer that all of this has been in the works for a while. 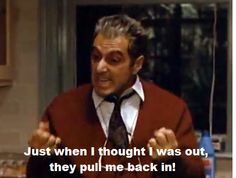 As soon as Addazio demoted Fitch, there were rumblings he was unhappy. Despite his shortcomings as an OC, Fitch was a very good recruiter, so it was important for him to stay on until all LOIs were signed. I am not sure why BC waited on Albert. Like Fitch, there was gossip he would be gone for weeks. Unlike Fitch, he wasn't critical to recruiting. In their places come two familiar names. Paul Pasqualoni gave Addazio his first big break in college and has served as a long-time mentor. Hopefully he can help Addazio through this rough stretch. He's overqualified as a Defensive Line coach and should be a good local recruiter. Rich Gunnell will now be Wide Receivers coach. Since wrapping up his playing career, Gunnell spent time as a GA at BC, a DLine coach at Tufts and a Head Coach in High School. He's an unknown at this level. But the staff needs youth and someone who can connect with recruits. The school also announced that Ricky Brown will be a recruiting coordinator/quality control coach. This is more administrative and does not count towards the NCAA ten staffer limit. I am sure Brown will be helpful, but he will not be on the road recruiting and has some limitations with player interactions. All in all, I think Addazio upgraded. He removed an underperforming recruiter, added some youth and added a mentor/game manager. Maybe 3-9 was the turning point. What is the path back to success? It was fitting that BC's poorly rated recruiting class signed on the same day as the basketball team lost again. Many BC fans are wondering: "will it every get better" and "what do the coaches have to do?" The simple answer is "yes" and "everything." I don't know if Addazio and Christian will be the ones to fix their respective programs, because I feel like both are missing an element to true, long-term success. Talent is what is most important in all sports. At a basic level, Christian and Addazio (and Brad Bates) get that. Addazio is a passionate recruiter and Christian put an emphasis on hiring ace recruiters for his staff. BC is never going to have its pick of the best players. For the sake of this post (and your own sanity), just accept that. However, BC can still get enough elite talent to win championships. But to win those championships, BC needs really, really good talent AND systems in which that talent can excel. The system aspect is where I feel like Christian and Addazio are both missing the mark. Addazio got me thinking about systems with his Signing Day press conference. He acknowledged that BC can't really outskill top teams. He said the emphasis is going to have to be on OL and DL. It was an echo of the Pro Style discussion. Addazio has upgraded the skill talent, but not to the level where we can win on skill alone. Now he is banking on OL success and a slightly different look and style of play from most of the conference. It is the formula that worked before. I hope he can execute it at BC. If Addazio is transitioning towards a different system, Christian is showing no signs of the same structure. Losing to Virginia should serve as a reminder. The Bennetts have won without elite talent, but with a rigid system (in their case pack line D). We've used more zone of late, but haven't gone all in on anything offensively or defensively. It is sort of the opposite of Donahue (and even Skinner). On paper Christian's talent is an upgrade, but the talent still seems lost. Perhaps it will click as they age, but I prefer a more proven model in case the talent doesn't ever reach elite levels. The way the basketball season is headed, I think all BC fans will be questioning the future. Things will get better. I just hope it is sooner rather than later. Rivals ranks BC 88th nationally and last in the ACC. Scout ranks BC 71st nationally and last in the ACC. 247 ranks BC 78th nationally and last in the ACC. As a trend, this is not good. However, I am not all doom and gloom on this group. Its size was going to hurt the rankings. BC touts the transfers, but the recruiting rankings do not. Therefore incoming QB Patrick Towles, incoming OL Jimmy Lowery and incoming punter Satchel Ziffer do not influence the rankings. As I have been pounding home, those sorts of 5th year transfers are a better use of Addazio's scholarship count than a raw freshman. All three of those guys can make an immediate impact. Addazio's press conference was pretty typical: "leaders" "great kids" etc. I don't think Addazio fakes enthusiasm well, so I take his high regard for this team as genuine. I didn't love his youth excuse making, but let's see how this season progresses. The only new nugget that stood out to me was Addazio mentioning Catholic schools across the country. We've always recruited pockets of Catholic schools in certain regions, but never tried to blanket all the Catholic schools across the country. It is a great idea. We have a natural "in" and at many of those places the Admission's Office is already familiar with the school's academics. We won't know about this class for a few years. I won't worry about the rankings. All that matters is what Addazio does with them. Jim Unis was one of BC's most highly touted recruits. Unfortunately head injuries and concussions cut his career short. At the time, the news of his retirement received decent local coverage, but nothing national. When Spencer Rositano retired from football due to lingering concussion issues, his hometown D.C./Virginia media covered the story too, but that was it. In a measurement of how things have changed, James Hendren's concussion-related retirement sparked a good deal of national interest. All Hendren did was post the information on his Instagram page. From there it made it to the blogesphere and the message boards. On Tuesday, Yahoo, Fox Sports, The Score and others all reported on his decision. This is for a freshman backup on a 3-9 team. If Hendren had blown out his knee, there is no way it makes that type of news. The media isn't interested in this kid. They are interested in his head. I don't take concussions or head injuries lightly. I was upset when BC played Rouse after he was clearly wobbling during a game. But I also hope the media doesn't exploit these kids just because football-related concussions are a hot topic. These are still young men whose dream just ended. 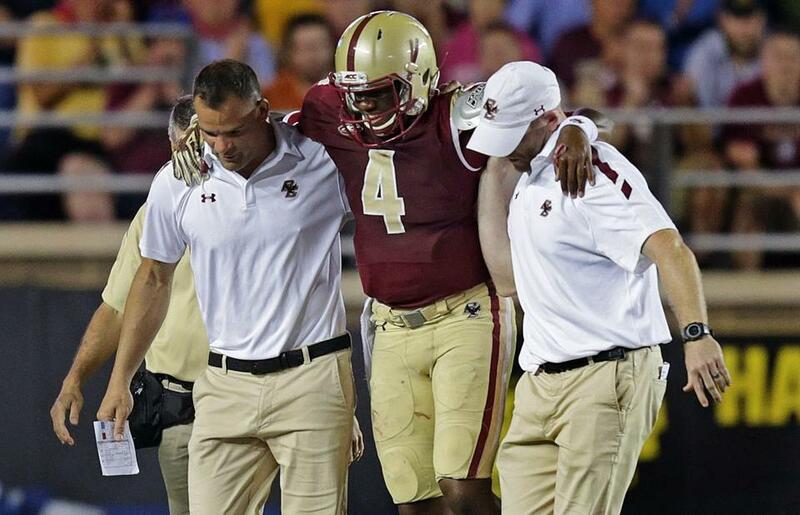 Fortunately BC does a good job of keeping injured players involved in the program. Unis helped the TOB teams after he couldn't play. And BC pushed them to all complete their degrees. Football still remains dangerous, but BC does care about these kids in ways other schools do not. I wish Hendren the best and his future headlines are not related to his injury. Given that this was the best Harvard team BC has faced in a Beanpot Opener, getting a win is a major positive. Throw in a BC comeback and winning with a very thin list of Goalie, a 3-2 victory feels good. Casey Fitzgerald started off the scoring. Sanford tied it up and then White scored BC's go ahead goal. Demko saved 21 shots. BC will face the winner of Northeastern and BU for the Championship next Monday.